Extracting biodegradable plastics from sludge. Raising food-grade crickets on household compost and turning them into high-protein flour. Using mobile diagnostics to deliver affordable hearing aids to children in developing countries. Those were just three of the winning ideas to emerge from the Dobson Cup 2012 business plan competition, hosted by the Dobson Centre for Entrepreneurial Studies at the Desautels Faculty of Management. The recent awards ceremony capped the fourth annual edition of the contest, designed to foster potential entrepreneurs at McGill. Extracting biodegradable plastics from sludge. Raising food-grade crickets on household compost and turning them into high-protein flour. Using mobile diagnostics to deliver affordable hearing aids to children in developing countries. 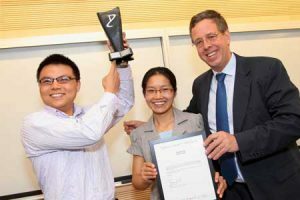 Those were just three of the winning ideas to emerge from the Dobson Cup 2012 business plan competition, hosted by the Dobson Centre for Entrepreneurial Studies at the Desautels Faculty of Management. The recent awards ceremony capped the fourth annual edition of the contest, designed to foster potential entrepreneurs at McGill. This year’s field of entrants was by far the biggest yet, and certainly one of the most varied, as the program continued to draw increasing interest among students and alumni from across the University’s campuses. More than 90 teams submitted plans for business or non-profit startups this year – up from 58 last year and just 18 in 2009, when the contest was launched. Teams may include up to five individuals, including at least one who is a McGill student, employee or alumnus. Judging focuses on innovativeness, growth potential, and feasibility of the plans. The competition provides winners with some start-up cash – but much of the value for participants comes from the mentorship they get from experienced business people throughout the weeks-long process of honing their proposals. Taking home the $10,000 top prize in the for-profit category was PHA Bio-Plastics, the sludge-to-plastics project developed by a pair of PhD candidates from the Civil Engineering and Biology departments. Jing Li and Xiaoyong Liu, both environmentalists, had come up with the concept while swapping ideas about their research. Their doctoral studies left them little time to pursue the plan – but when they spotted a notice about the Dobson Cup, “we decided to take this opportunity to push ourselves,” Liu recalls. Li’s lab has shown that biodegradable plastics can be extracted from sludge, providing a method to sustainably produce a potential replacement material for petroleum-derived plastics. The two doctoral candidates worked up their presentation with help from an undergraduate student in Biochemistry, Xinlu Li. In the Not-for-Profit category, Hearing Express, an initiative devoted to providing affordable, high-quality hearing aids to children in developing countries, took the top prize. The team, which includes a McGill alumnus, plans to use the $7,000 in prize money to help launch a pilot project in Jordan this summer. Second-place in the for-profit category went to ZuubEmpire, an interactive second-language learning course for teens and adults. Avery Rueb, a 2010 Desautels MBA graduate and CEGEP language teacher, came up with the idea by combining his interests in applied linguistics and gaming. Jakub Dzamba, a PhD candidate in architecture, cooked up the Third Millennium Farming cricket-harvesting project as a by-product of his doctoral work. He’s already raising crickets on a small scale – and the $7,000 in third-place prize money could help him get some bigger projects going in the months ahead. MUthins, a 2011 startup devoted to “changing the snacking habits of our community through the introduction of a low-calorie, all-natural line of bran muffins,“ snagged the $6,000 fifth-place award. Other Not-for-Profit prize winners were Lotus Centre, dedicated to providing music lessons for children with developmental disorders and learning disabilities; Made in Montreal, an urban-planning firm specializing in local economical development services for Montreal manufacturers; and F.I.L.E., an organization that aims to create a free summer day camp for children from low-income families.